MMJ: The Last Few Days! It was hot, hot, hot in London on Monday, so this dress was perfect. Apologies for the crazed expression! Roobeedoo commented that this skirt looks Bodenesque so I thought I'd embrace the fact today! It's a Colette Patterns frenzy today. Well, I've done it, I've worn at least one me-made garment every day for the month of June! I'm feeling pretty pleased with myself, I must admit. If you'd told me I'd have been doing this challenge last June, I'd have stared at you blankly, having exactly two me-made garments in my wardrobe at that point. So what have I taken away from this challenge? I've realised that the vast majority of my me-made garments form a capsule wardrobe i.e. they can all be worn with each other. This was part intentional, part accidental but it's come in very useful during the past month. The above point is true because most of my wardrobe is made up of navy blue, with the odd splash of red, grey and occasional green. I need to experiment with a few more colours. The surprise star of MMJ has been my Beignet skirt. I barely even considered it for this challenge as I thought it was strictly a 'must be worn with tights skirt'. How wrong I was. I've also realised I'm not too old to show my knees. Taking my photo every day, although tiresome, really highlights which styles suit me and which don't. I think high waists are more flattering on me, as are knee length skirts. I love wearing my handmade clothes, and any compliments I've received during the past month have felt well and truly earned. I've really, really enjoyed taking part in this challenge, I've loved seeing how everybody else has been wearing their handmade clothes on a day to day basis. Being part of the MMJ Flickr Group community has also been very inspiring. You'd be hard pressed to find a more talented and supportive group of people anywhere. Thank you Zoe for setting the challenge, and thank you to everybody who read my MMJ posts and took the time to comment. Your encouraging comments, compliments and advice on what to wear were the highlight of my day. This is a pretty easy combination and was exactly what I wore on Day 12 too. After languishing in my wardrobe unworn since its birth, this top has received the most compliments of all my me-made clothes this month. Very strange. Today was hot, hot, hot so I decided to give my new Sorbetto a spin. I made this top with the intention of taking it on holiday so today's hot weather was a good practice run. Verdict? Perfect, really cool in hot weather. Along with the entire sewing world, I’ve been very tempted by the Colette Patterns new, free download, the Sorbetto. And who wouldn’t be tempted? All the irresistible elements were there: free pattern, only two pattern pieces, easy peasy and quick to make. It was Karen’s assurance that she barely used half a yard of fabric that finally lured me in. I promptly e-mailed Karen for sizing advice and she wisely suggested adding an extra inch to the two inches she’s already lengthened her version by. Good advice - in its original state, the Sorbetto is virtually a crop top. I originally bought this Ikea fabric with the intention of making a skirt, but it was soon usurped by a whole load of other skirt contenders and I forgot about it. I rediscovered it again recently and it was the perfect fabric for a muslin/first attempt – very light and summery. The fit was fine, although still a bit boxy for me so I took in the side seams a little. I also followed Karen’s advice to use French seams which means no raw edges are on display (the neck and armholes are bias bound). Once cut out, the entire thing took barely an hour to sew – definitely my kind of top. I tried wearing it with all different kinds of bottom halves, tucked in, untucked, belted etc and this was the combination I liked the best. For me, it’s definitely a holiday top as it’s a bit too vest-like for everyday wear. But hey, give me a linen vest with front pleat and bias edges over a shop bought vest any day of the week. It’s tempting to make another one for my holiday because it’s so quick to make and uses so little fabric, but I think a sleeveless version of the Pendrell is probably more me. I’m going to make another Pendrell and see which looks the best… a sleeveless top version of the Pepsi challenge if you will. This skirt is a winter wool skirt which I had to retrieve from its packed-away state to combat the weather. I've worn it to death, it's very plain but a really good fit, and it goes with everything. I really like this blouse and will try to wear it more. Not necessarily with this skirt though, I think just on the knee is a more flattering length for me. My Beignet is fast becoming the skirt equivalent of my 1940's trousers. A second version is right at the top of my list after MMJ is finished. I made this skirt as an in-between project on my dressmaking course (we were supposed to make one garment per term but you know me, I wanted to gallop ahead.) I'm amazed by how well made it is: perfectly constructed lining, invisible zip, cool waistband made from bias tape etc. Beginner's luck I think! I think four days of outfits is about the maximum anybody can stomach at any one time, so this post will take me up to two days ago. I wish I could claim it was my own idea to wear these two me-made items together, sadly it wasn't, it was Roobeedoo's! She was spot on though, as I love red and turquoise together, why didn't I think of it?! Still feeling in a turquoise mood, hence the top. I did try the two turquoise items together but I looked like a nurse. Strangely enough, I wore this dress a lot in the winter with tights and a cardigan. I was hoping to wear it in a summery way today but couldn't because a) my limbs were a similar hue to the actual dress - not a good look and b) weather conditions in the UK in June were positively wintery (!) so tights and cardigan it was. ...and with good reason. Even though the fabric is gorgeous I'm really cross that I wasted it on this top as I hated wearing it and will probably never wear it again. Reasons? Too short, too drawstringy and the neck is still uncomfortably high. The fabric is too pretty to cast aside though, so I think I can refashion it by lowering the neckline (again) and taking the casing out at the bottom to increase the length. Grrr. I even look like I'm smiling through gritted teeth, which I was! Along with gingham, polka dots will always hold a special place in my heart. In fact it's a daily battle to stop myself sewing every single thing I make in polka dots, I love them so. When I first saw the Colette Patterns Violet blouse pattern, with its super-cute Peter Pan collar, there was never any doubt what fabric I'd use for it! So without further ado, let me introduce you to Miss Violet.. I used a stretch cotton polka dot fabric I found in Cheltenham and vintage fish-eye buttons from eBay. In terms of construction, this is probably my favourite Colette pattern to date. Everything fits together perfectly, just like a jigsaw. It probably helps that the last few tops I've made have all been blouses with collars and facings, so it was pretty easy for me to get my head round the instructions from the start. It came together like a dream and I had no sizing issues. I made a size 8 (I'd say the equivalent of a UK size 12) and the only adjustment I made was to lengthen it by 1.5 inches. This was because I thought I'd like to wear it untucked, but actually the style of the blouse looks best tucked in on me. It's still wider at the waist than I'm used to and I was considering taking the side seams in but actually, once tucked in, it's more comfortable having that extra bit of room. I'm especially pleased with the fit across the bust and the shoulders - the two areas where I usually encounter problems. I'm really pleased with it. I love the neat, feminine style and it has some really pretty details: back yoke gathers, slightly gathered sleeves and my personal favourite, a Peter Pan collar. We're nearly halfway through June now and I still haven't been filled with despair over what to wear yet! I needed to wear something pretty comfortable today as I was lugging things around on my craft stall. I love this gingham top! I wear this Pendrell a lot, usually untucked, as it's super long and you get the full benefit of the lovely fabric that way. It always perks up the plainest of outfits with very little effort. My default combination of red and navy. Never fails. Fab weather today so out came the legs - wahay! After a good deal of pondering and chin stroking I finally decided what I wanted to do about my Oolong lining. I would underline it with a plain, similar coloured muslin. Now, being both lazy AND impatient I didn't think I could bear two separate sessions of cutting out from a single layer of fabric on the bias. So I put the underlining fabric underneath the dress fabric and cut them together. Most unorthodox, but it did save a lot of time. I then pressed each pattern piece which more or less caused the two layers to fuse together. An hour of sewing later and my fabric was underlined. It couldn't have been more straight forward if I'd tried - the complete opposite of my silk lining fiasco in fact. Phew. Now it was time to sew the bodice. At this point I consulted Sunni's tips for sewing on the bias. Sunni gave me some excellent advice after my last Oolong post and plea for help. I'm re-iterating them here but you can also find them in the Sewing School section of her blog, A Fashionable Stitch. I urge anybody thinking of sewing on the bias to read through her tips before you begin - they're REALLY helpful. Use a longer stitch length than you probably normally do - like a 3mm. You can straight stitch or zigzag, but longer is better so that when the bias shrinks back up it won't pucker. As you sew, pull/stretch the seams as you go (just a little, don't try to distort it). It really does work and helps the seams not to pucker too! One more tip when sewing is to sew strips of tissue paper or freezer paper to the actual seams. Then tear them away after you've sewn your seam. I personally don't think that hanging the pieces - like the pattern says - really helps anything. Instead, hang the finished garment for 24 hours. Don't finish the edges with a serger, instead pink or zigzag after you sew the seam. Following the above tips to the letter (yes, even the tissue paper one), I sewed up the bodice which was now cut a size larger (8) and tried it on. Joy of joys, it fitted! I then sewed the skirt section and attached them together. I'm now the proud owner of a bias cut dress (still minus sleeves and facings though). The relief of it all working out OK in the end is enormous, I really thought I'd have to abandon the whole project. It was worth persevering, as a bias cut dress skims your curves in the most flattering way. Even though I say so myself, it looks much better on me than it does on the dummy, but here's a sneaky peek on said dummy anyway. I'll let you see the finished dress on its owner when I've given it sleeves and hemmed it. Wahay! My first C category wear, otherwise known as the poor children of my wardrobe. After twenty minutes of trying to get this wrap top into place, I realised why it's never been worn, whatever I did, it just wouldn't stay in place and as soon as I moved it all went horribly wrong. Finally, just as I was about to take the scissors to it, I tied it at the front, instead of wrapping it around me and voila, I could walk and move in it. Success! I've only worn this skirt a couple of times but that's mainly because it's quite a recent make. With hindsight, I should probably have hemmed it a bit higher, but it's a nice shape and a pretty good basic. Another one from category C, but that's because I only made it about two weeks ago. It's made from the same pattern at the previous day's skirt, but this version seems to have a bit more pizazz to it, probably because of the splashes of red in the fabric. Thank you to everybody who took the time to comment on my last post. I LOVED reading about how long you’ve all been sewing, how you’d categorise yourselves and what you've achieved (a lot). It’s a subject I could happily discuss for days on end and never tire of. I’ll definitely be returning to it at a later date. In the meantime, I’ve got outfits to talk about. Want to know what I’ve been wearing for the past three days? Read on..
I’ve only worn this blouse once before, but it was when I met up with my lovely fellow bloggers in Brighton so it did have an appreciative audience! Today, paired with my 1940’s trousers, this was a super comfortable outfit. I ended up staying indoors as it rained all day so they were in effect a form of high class PJ’s. And yes, I was totally overdressed for a day of slouching around, but did I care? No. These trousers are amongst my most worn me-made pieces. They go with absolutely everything and make my legs look longer than they actually are. What’s not to like? What are your best bits? Tilly wrote a really thought-provoking post yesterday about how we categorise ourselves as stitchers. When do we stop being novices or beginners and start thinking of ourselves as intermediate? It really got me thinking... 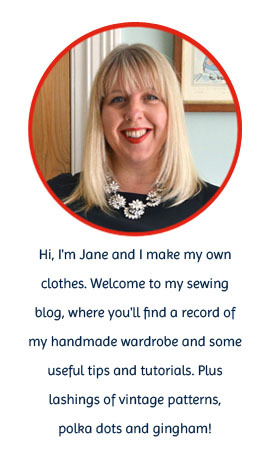 I started sewing when I signed up for a dressmaking course in September 2009. I only initially signed up for a term but loved it so much I ended up doing a whole year. After that year I felt confident enough to embark on sewing my own clothes from patterns without the safety net of my sewing teacher permanently on tap. It also coincided with the start of my blog. I was still very much a beginner in all sorts of ways. Since then I've sewn a lot of clothes myself, participated in several sewalongs and started selling things at craft fairs. I think I can tentatively class myself as an intermediate stitcher now. As Tilly points out though, the flip side is that there's lots of fearless trying out of new techniques at the beginning which tends to grind to a halt after a while. Yes, my sewing productivity is high, but most of it is repeat makes of tried and tested patterns. This is by no means a bad thing, in fact quite the opposite as I tend to make second versions of the clothes I know are a good fit. But it's always good to push yourself a bit, so I'll definitely be trying to add some challenges to my sewing this year. I then started thinking about what I've achieved this past year and a half that I'm really proud of…. ...after long consideration, I think making myself a pair of trousers and sewing a skirt from a Japanese pattern book are the two things I'm most proud of. If you'd told me I'd be doing either of those things 18 months ago I'd have laughed long and hard in your face! So I suppose nothing is too difficult if you set your mind to it (except bound buttonholes and sewing with slippery silk lining fabric maybe). I've worn this dress twice. Despite spending what seemed like weeks on end working on the fit of the bodice, it still doesn't feel like it fits properly on the shoulders. Once it's on though, it's wonderfully cool and swishy and was perfect for yesterday's sunny weather in London. The MMJ Flickr Group mini-challenge for that day was to photograph ourselves spinning. Well, that should be easy in this dress, I thought. Not quite. My two 'helpers' thought it was absolutely hilarious seeing me spinning around like a lunatic in front of the camera and insisted on jumping into every shot! Me-made clothes I wear all the time and that I feel are indistinguishable from store-bought clothes. Happily, about two thirds of my handmade clothes fall into this category. Me-made clothes that have been worn once or twice but for some reason haven't really made the grade. Me-made clothes that have never been worn. Ever. These are the clothes equivalents of those poor kids that used to always get chosen last for the rounders team. I feel more than a little sorry for them and a bit guilty too, so one of my objectives is to give the clothes in this category a turn and actually wear them. There are only three pieces in this category and they're all lovely. "So why don't you wear them?" I hear you all cry. I will. I will. I promise.